I made a paella this weekend. While simple and rustic, this dish calls for a cornucopia of clams, shrimp, lobster, chorizo and chicken. But the most extravagant ingredient, by an order of magnitude by volume, is saffron. And as anyone who knows will tell you, don’t bother making a paella without it. After stuffing my basket with WholeFood’s proteins, I swung by the beer aisle to scope some new brews. And that’s when it hit me — Midas Touch. It’s been awhile since I’d had this unique brew, and I recalled a smooth, tea-like beer with honey-fermented clarity and some spice. Part of Dogfish Head’s Ancient Ales line-up, this beer was made from a recipe derived from examining clay shards from brewing vessels unearthed in the tomb of King Midas (the one who turned everything to gold with his cursed touch). One of its most unusual ingredients is saffron. I was on to a pairing. 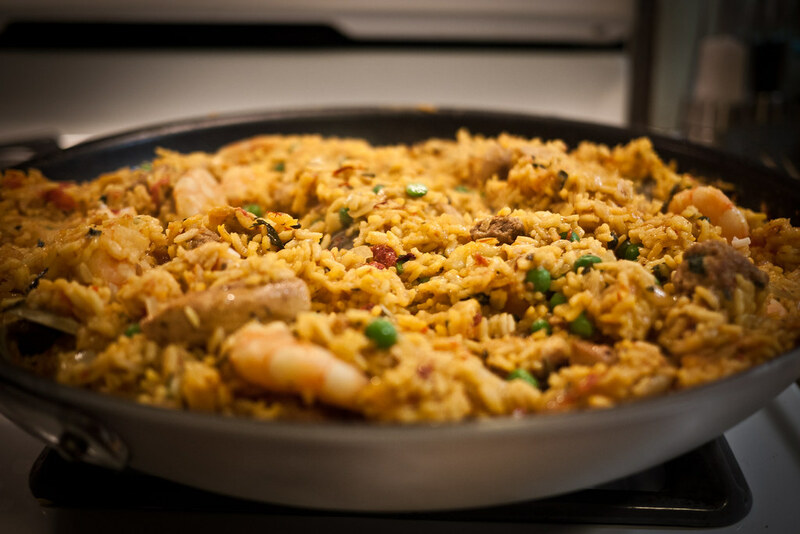 Paella has some strong flavors but nothing too hot, so I felt the general mellowness of Midas Touch would stand up fine. As it turns out, it’s a bit too delicate to fight through some of the stronger spices of the chorizo. But with the clams, shrimp, lobster and chicken, it was lovely. 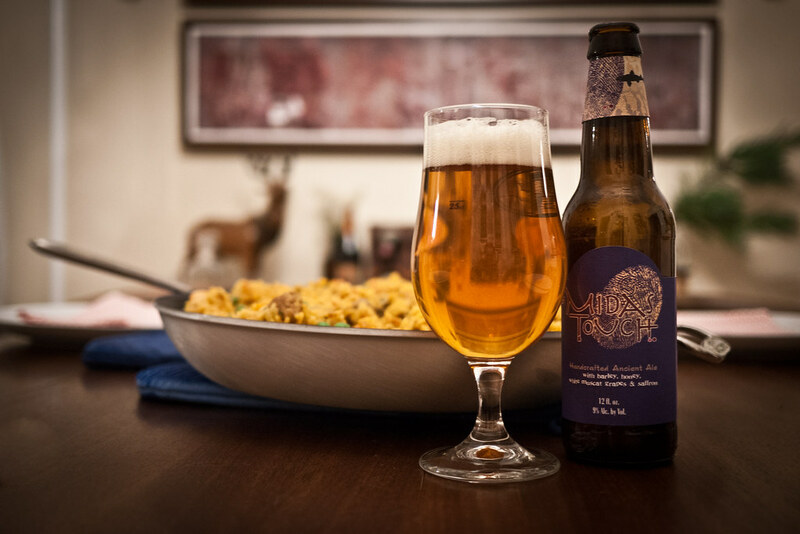 It has a nice, cooling viscosity on the palate like a Scottish ale or a drier mead, and barely a hint of citrus that brightened against the sweeter notes of the rice. Something a bit paler might have been more ideal for contrast, but this was a great experiment with shared ingredients.